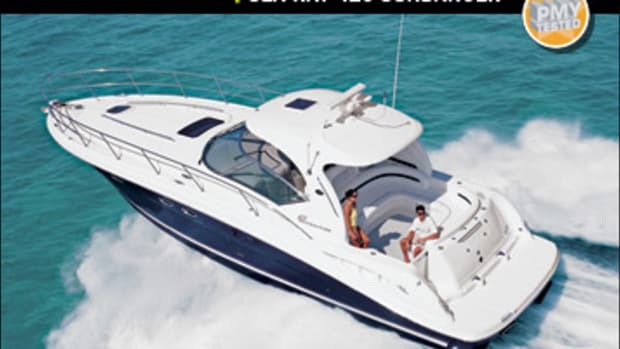 With its 510 Sundancer, Sea Ray takes one of its best… and makes it even better. Sometimes good enough is best left alone. 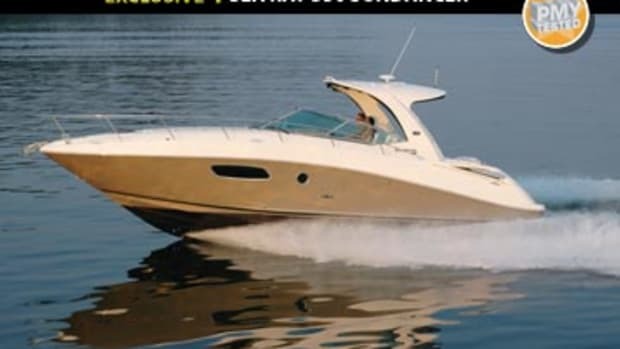 If you find something that works, like Sea Ray did with its highly popular 500 Sundancer, you may not want to futz with it. After all, if it ain’t broke, don’t fix it blah blah blah. But that’s the exact attitude that stamps out innovation, welcomes stagnation, and ensures that your best years are left behind you. 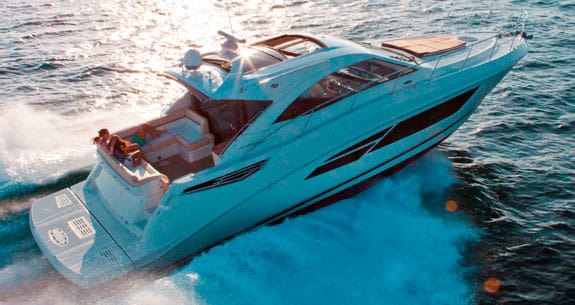 Thus, Sea Ray has brought us the 510 Sundancer, an admirable vessel that makes some major advancements over her clear forebear, and which pushes the Sundancer sport-yacht line ever closer to the realm of a true yacht. 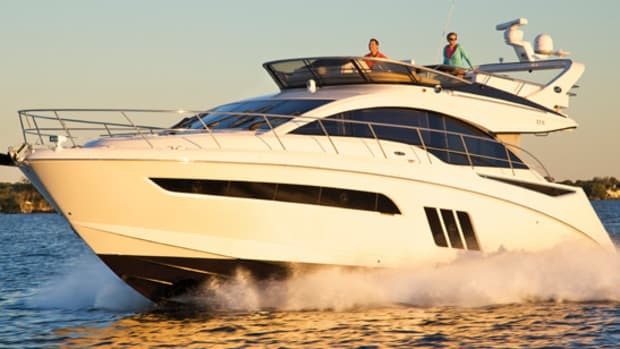 Easily the biggest change between the two boats is that the 510 has an enclosed saloon, what Sea Ray refers to as her ‘sunroom.’ That’s not too much of an overstatement either since large side windows—which are raked aggressively to aid in the profile’s sleekness—keep the space full of natural light. When coupled with an electrically actuated sunroof overhead, the area can achieve a true indoor/outdoor feel if an owner desires. The saloon sole on my test boat was made of a rich, dark bamboo, a shade I can’t recall seeing before. When contrasted with the pearly white leather on the helm and port-side settee, the sole gave the space a very pleasing cookies n’ crème look. And I’d bet dollars to donuts that color scheme would do well on the brokerage market, a concern that should always be present in any prospective buyer’s mind. The saloon also has a long, L-shaped dinette to port. The table there has a fixed height, which negates turning the adjoining settee into a guest berth, but it does flip up so you can scooch around with ease. To starboard, a Toshiba flatscreen television nestles above a sink, fridge, and serviceable bar stowage—pretty much everything you’d need for a party. The aft end of the sunroom houses one of the advancements Sea Ray is most excited about on this boat, sliding glass doors that open to provide a step-less, nearly flat entry into the cockpit. When those doors are opened up, the indoor and outdoor areas meld almost seamlessly into one, giant entertainment area. Above the cockpit Sea Ray has installed an electrically actuated canvas sunshade that provides relief to almost the entire cockpit. That’s a feature that might go slightly unheralded at first, but is one you’ll be thankful for in the long run. 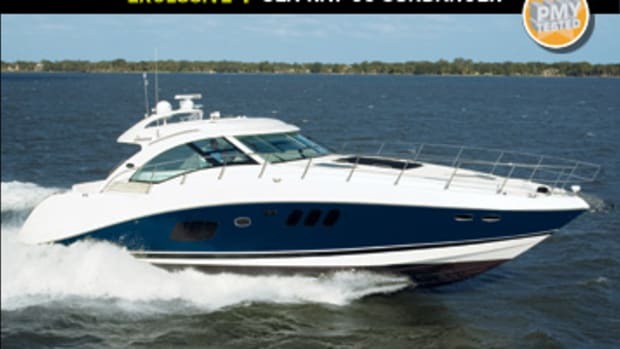 Picture it: You’re at a boat show, you’re onboard this big, flashy, expensive boat, and the salesman is trying to show you some piece of canvas that folds out over the cockpit like it’s the main selling point. And you’re thinking, Sure buddy, why don’t we go check out the master? But then one beautiful Bahamian afternoon you’re moored at your favorite cay without a care in the world—except that everybody in the cockpit is absolutely getting baked by the sun. That’s when you realize the salesman’s wisdom, and when you become everybody’s hero at the touch of a button. Now, about that galley. It’s down five wide and sturdy steps from the main deck and is a major part of what might be described as a secondary saloon. For my money, this space is one of the boat’s true highlights. It’s private enough down here to lounge in peace without being totally cut off from the festivities taking place on the rest of the boat. The galley has a nearly full-sized fridge and freezer so you’ll never go hungry, and the settee to starboard is the perfect place to take a snooze on a rainy day. Especially since the steeply raked windshield acts as a huge skylight for the area. So you can fall asleep to the pitter-patter of raindrops on glass overhead, and then wake up when the sun comes out and get on with your day. Ahh, synergy. As for the accommodations on that lower level, there’s a well-laid-out forepeak VIP with good closet space and a roomy head that it shares with the lower saloon. The mattress here felt a bit short for my 6-foot frame but otherwise it’s a pretty sweet place to bunk down. 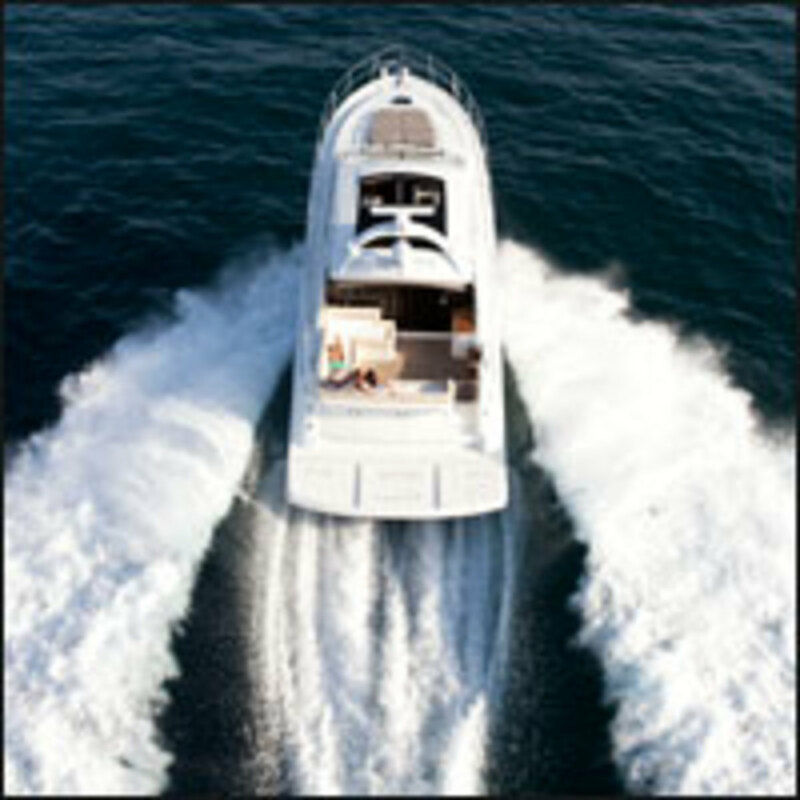 Sea Ray moved the master on the 510 from the forepeak, where it is on the 500, to amidships, after multiple customer requests. The result is a relatively large stateroom, an effect that is amplified by the many mirrors on its wall. Headroom was a little low above the berth, about 5 feet 9 inches, and natural light was not in abundance due to smallish portlights, but then again, abundant light and headroom aren’t really essential components of a room meant for sleeping. However, stability is essential, and that is gained in spades by moving the stateroom aft. 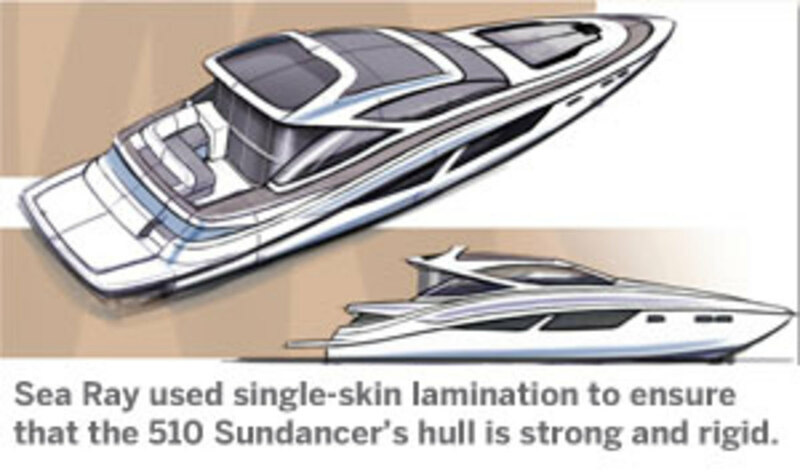 “Single-skin lamination is something we utilize on lots of our vessels, from sport boats up to sport yachts, such as the 510DA. It’s a very consistent lamination method that achieves the structural properties we require. 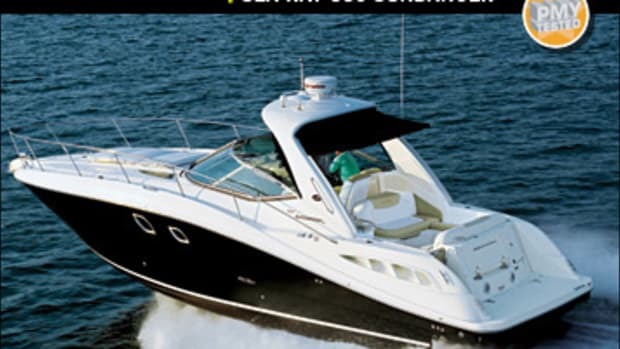 It also gives the boat the solid feel that Sea Ray has come to be known for. But OK, enough with the interior. On to the part of the test a lot of owners care about most: performance, an aspect that’s doubly interesting since the 510 has a different hull than the 500. The captain mans the yacht from a double-wide helm seat and has Raymarine everything staring back at him from the console. Optional bow and stern thrusters are available for slow-speed maneuverability, and are a boon for docking in tight spaces or in high wind. At speed, the Sundancer is a joy. Her lines of sight are good, not tight overhead as is a congenital problem with many sports cruisers. If one really wanted to split hairs they might say that the aft structural bulwarks, which prevent the saloon windows from being truly panoramic, restrict vision, but I didn’t find that the case at all, and feel it would just be grumbling for grumbles sake. The boat, with her twin Cummins QSC8.3-600s matched to V-drives, was zippy enough. We hit a top speed near 30 knots and snapped from a dead stop to plane in 8 seconds. She also ripped through corkscrews in less than two boat lengths at WOT with minimal heel and loped through S-turns with grace and power. Conditions where we tested her were flat, but I sent her through passing wakes when I could, and was pleased with the way her forefoot sliced through them, as well as with the resoundingly solid feel she had when met with these turbulences. 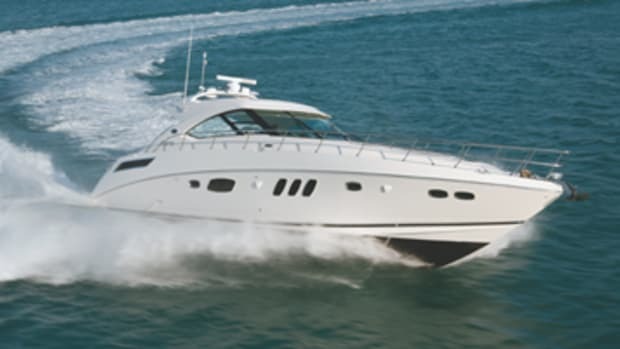 Such rigidity is in no small part due to the solid-skin lamination construction Sea Ray used to build her. Another notable feature, and one no doubt linked to her solid construction, is her quietness. 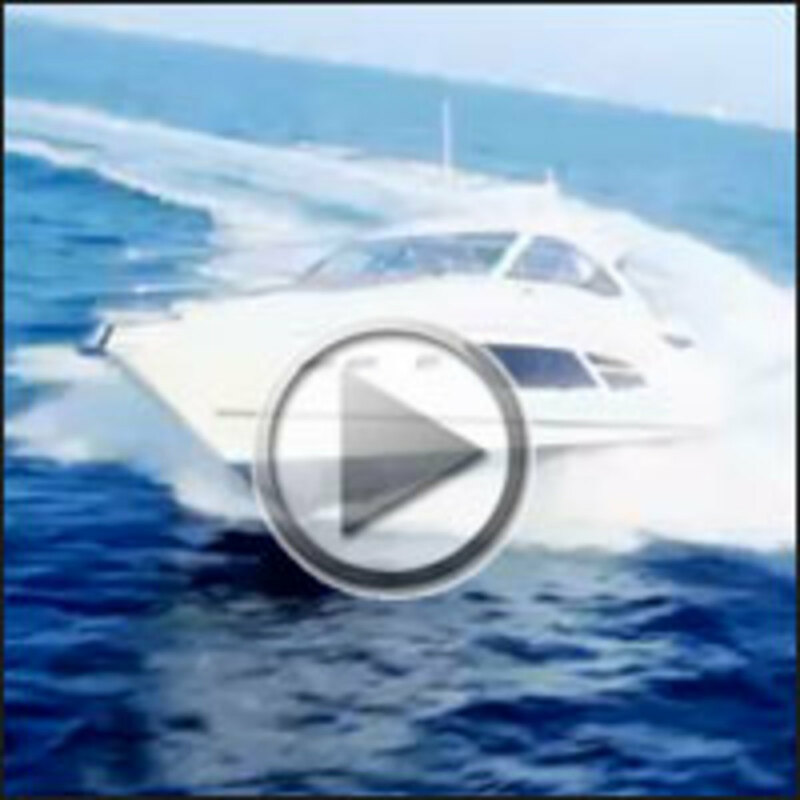 Even at WOT the boat never crested 80 decibels at the helm—an enviable achievement indeed. 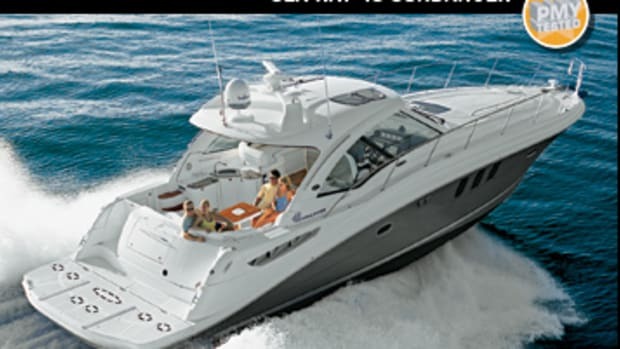 At first I thought the boat was built with Sea Ray’s vaunted Quiet Ride technology. 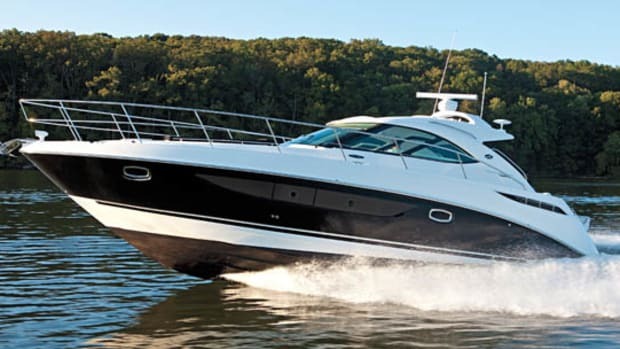 Sea Ray’s Web site claims Quiet Ride “uses acoustical forensics, advanced engineering, and sound-attenuation materials to deaden sound and vibration at the source.” But I’ve seen demonstrations with the stuff at boat shows, and believe you me, I know wizardry when I see it. And Quiet Ride is doubtless modern-day wizardry, and I assumed it accounted for the 510’s decibel readings. But (but! ), I was wrong. After my test I asked about the boat’s construction, and was perplexed to find that Sea Ray has not yet introduced Quiet Ride to its bigger boats. Thus the sound-deadening effects I was so impressed with came not from magic, but instead from rock-solid engineering fundamentals—no rattling pieces thanks to myriad positive-locking mechanisms, and no mismatched seams for extra groans. 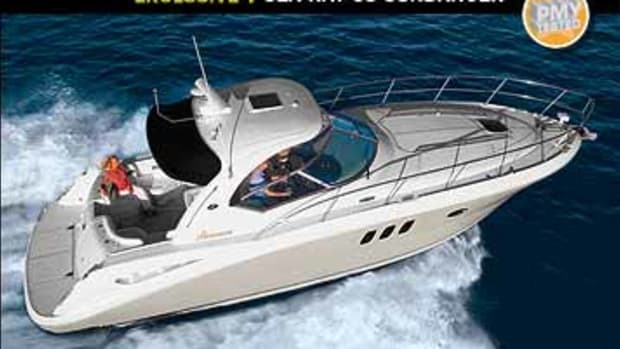 Just a sturdy piece of fiberglass that performs well and has thoughtfully designed onboard amenities. And those are two elements of a boat that nobody will ever want to change. 108 gal. fuel, 100 gal. water, 2 persons, 150 lb. gear.